Work continues on a new foot and mouth vaccine ahead of the planned closure of the Plum Island Animal Disease Center. Last June, the USDA granted a conditional license for a new foot and mouth vaccine for use in cattle. “These vaccines have been based upon using the live virus and modifying that virus that is synthesized not using the original live virus to create an immunity applied to animals,” said Edward Knipling. Knipling is the administrator for the Agricultural Research Service. After seven years of research ARS and Department of Homeland Security scientists developed the world’s first molecular foot and mouth vaccine. It is considered the most significant FMD development in 50 years. Scientists estimate it could cost anywhere from $54 million to $690 million to control even a small FMD outbreak-and that doesn't even consider the approximately $4 billion annual loss in export sales of U.S. beef. Because of the dreadful potential consequences of that one disease, Congress decreed in the early 1950's that the FMD virus could only be studied off the U.S. mainland-in other words, on an island. Today, biotechnology has advanced to the point where such work could safely be done in a facility on the mainland. President Barack Obama has proposed a budget calling for animal disease research such as that conducted on foot-and-mouth disease to be moved to Manhattan, Kansas, where a National Bio- and Agro-Defense Facility is under construction. The NBAF facility in Kansas is expected to take years to complete. To listen to an audio story about the FMD research at Plum Island, click on the LISTEN BAR below. 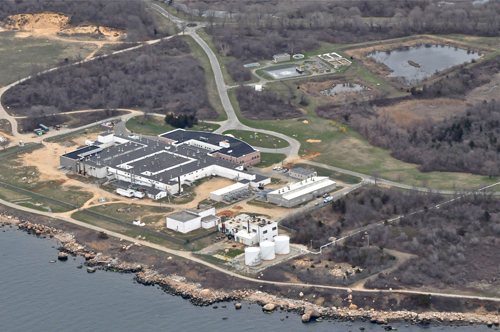 Plum Island researchers make FMD breakthrough ahead of facility's closing.